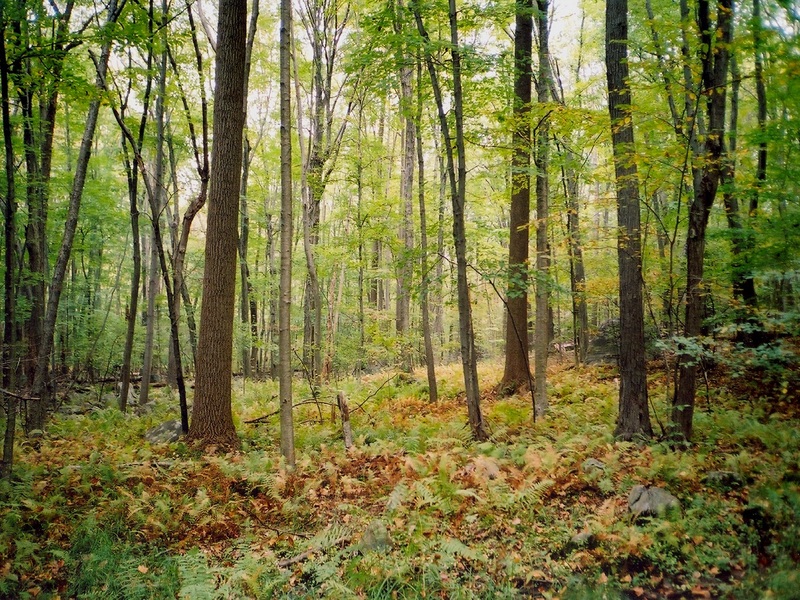 For a more complete map, see "Jersey Highlands Trails" in our map store. Length: 17.4 miles Click on the icons in the text below for photos. ALERT: The trail has been rerouted between Camp Jefferson and Route 181. See the MAP of the reroute. Please note: A permit is needed to hike in Newark's Pequannock Watershed and the Highlands Trail traverses the southwest portion of the Watershed land for the first 5 miles of this section. Obtain a permit and details on restrictions by calling (973) 697-2850, or visit the Newark Watershed website. Hunting Note: Some of the Highlands Trail on the watershed property experiences closures during hunting seasons. Cross Route 23 at the light at Canistear Road, turn left and follow Route 23 until it crosses the Pequannock River at 0.3 mile. 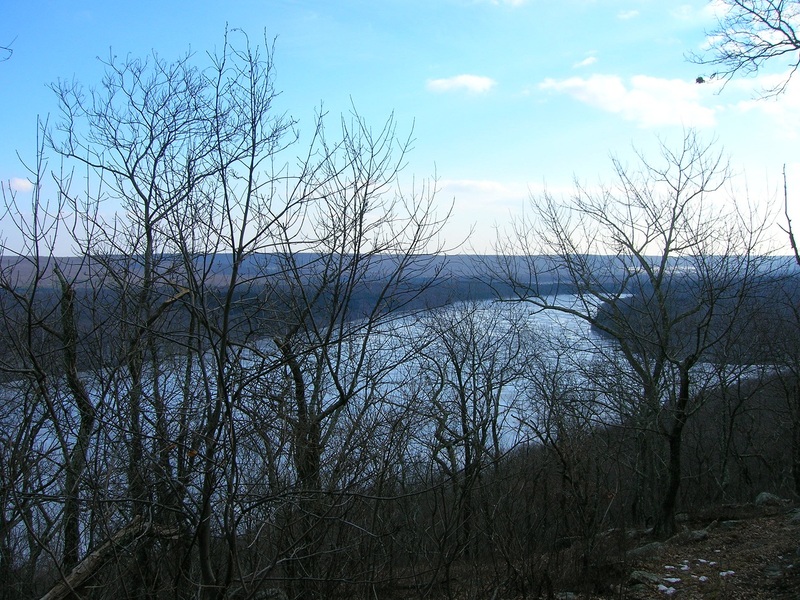 Turn right into the woods, ascend a ridge, and continue to a view of Oak Ridge Reservoir at 1.9 miles. From here turn west, crossing two ridges and several woods roads, reaching Holland Mountain Road at 3.8 miles. Continuing west across the road, following narrow paths and woods roads, crossing two streams, and reaching Rock Lodge Road at 4.6 miles. Cross Rock Lodge Road and continue over a hill, turn left onto a woods road, and reach Rock Lodge Road again, where you leave the Newark Watershed property (5.0 miles). Turn right onto Rock Lodge Road. At 5.2 miles Fall Drive bears off to the right. At 5.3 miles the pavement ends. This blazed dirt road forks several times. In some areas, it's difficult to blaze at the forks. When in doubt, take the straightest route. At 6.5 miles, just before a wetlands area, turn left off Rock Lodge Road into the Sparta Mountain Wildlife Management Area. Following woods roads and narrow paths, pass Ryker Lake and reach Russia Brook at 7.8 miles, emerging on Ridge Road at 7.9 miles. Cross Ridge Road, almost immediately pass under a power line, then go over two hills, meeting a woods road at 9.1 miles. Turn right onto the woods road and almost immediately left onto another woods road, then right onto a faint woods road at 9.3 miles. At 9.6 miles turn left, reaching Sparta Mountain Road at 10.0 miles. 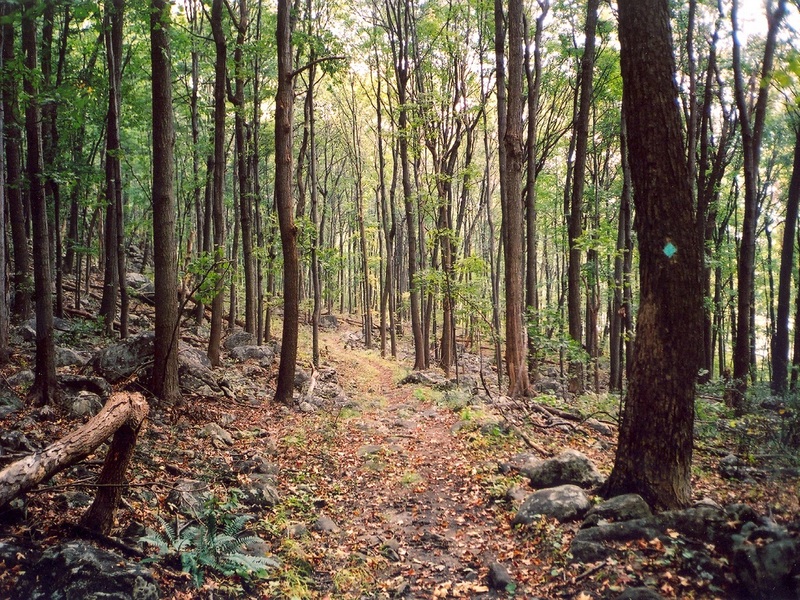 The next section of the Highlands Trail traverses Mahlon Dickerson Reservation and is managed by the Morris County Parks Commission. Some of the older blazes in Mahlon Dickerson are teal-colored rectangles. Cross Sparta Mountain Road and almost immediately reach the junction with the Pine Swamp Trail (white). Follow the co-aligned Pine Swamp and Highlands Trails to the left, reaching the north parking area at 11.5 miles. Cross Weldon Road at 11.6 miles, reaching Headley Overlook with a view toward the south, including Lake Hopatcong, at 11.9 miles. After passing a second overlook, cross a woods road and continue to Saffin Pond at 14.4 miles. Cross the new dam, with Saffin Pond on your right. Turn left onto the old Ogden Mine Railroad bed. After .4 miles, bear right off the railroad, crossing Weldon Road at 14.8 miles. Continue past a gate, and quickly come to a junction of woods roads. To the left is Winona Trail, a woods road blazed by teal diamonds with black centers. This meets up with and ends at the main HT route and can be used as a short cut. To the right is the main route, which also follows a woods road at this point. Follow this to a power line right-of-way at 15.3 miles where the woods road ends. Go under a tower, then bear slightly to the left to enter the woods on a narrow footpath. Pass near Route 15, then turn away from it, crossing the power line again and reaching Winona Trail again at 15.8 miles. Cross Winona Trail and ascend a low ridge .5 mile to a different set of power lines at the top of the ridge. 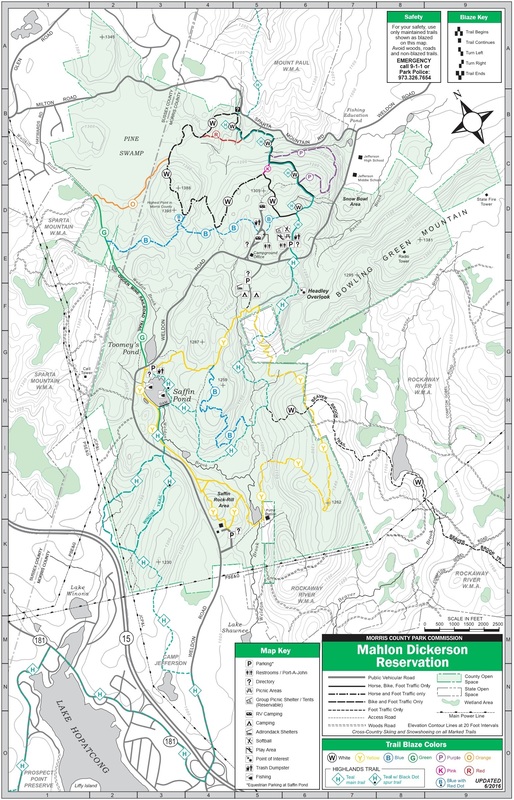 Note: At this point, you are leaving Mahlon Dickerson property and entering Jefferson Township Camp Jefferson property. The section through Camp Jefferson is closed weekdays while camp is in session between 9am and 3pm in June, July and August. Hiking this section is prohibited during these times. Go under a power line tower, re-enter the woods and quickly come to a junction with the Lower Trail (blue) on your left. At this point, Camp Jefferson’s Upper Trail (yellow) joins the HT. 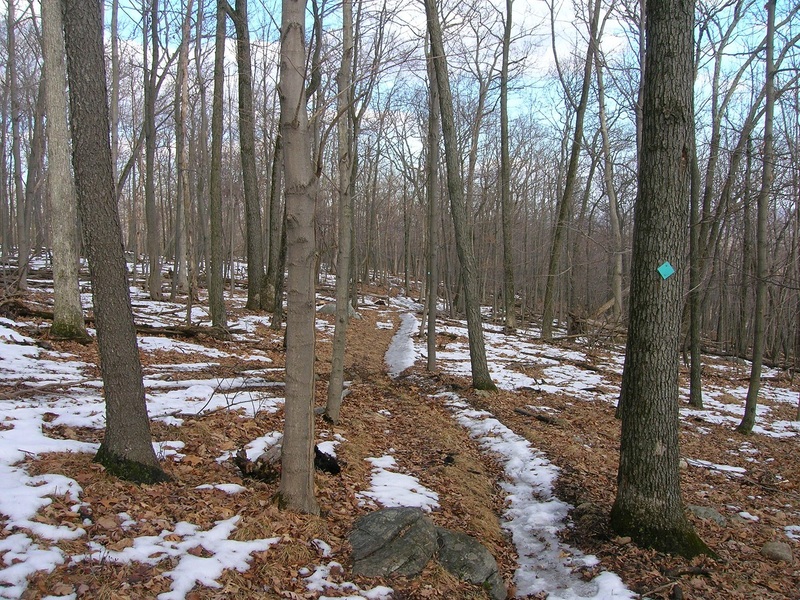 Continue on the co-aligned trails, passing the Middle Trail (orange) on your left along the way. Pass the other end of the Lower Trail (blue) on your left, then turn left on a woods road and drop down to Camp Jefferson. Walk out to the parking lot, reaching Weldon Road . 9 miles from Winona Trail and 16.7 miles from Route 23. There is no trail connection between Camp Jefferson and the next trail head. A 3 mile road walk is blazed. .7 miles of this road walk is described here, and the rest is decribed on the next section description. Turn right on Weldon Road, cross over Route 15 at on an overpass, and reach Route 181 at .7 miles, and 17.4 miles from Route 23.